The Nystagmus Network charity will use ‘Wobbly Wednesday’ on 1 November 2017 to raise funds for the most common eye condition found in school-aged children. Nystagmus is a condition which causes the eyes to move involuntarily. The eyes can wobble or flicker from side to side, up and down or in a circular motion. Nystagmus affects around 1 in 500 people but it’s not known why it affects some and not others. What’s happening on Wobbly Wednesday? You can download a nystagmus presentation to play on the screens in your eye clinic waiting room or GP reception. There are also balloons, wristbands and flyers available to give out to parents and children to help raise awareness for the condition. Tell all the families you work with about the Nystagmus ‘Big Swim’. It doesn’t matter how confident they (or you!) are at swimming because everyone can take part. Anyone who gets involved can set their own personal ‘Big Swim’ challenge, from booking a first lesson at the local pool or crossing the English Channel. Don’t forget to collect sponsorship donations and use the hashtag #nystagmusbigswim on social media to follow other people's Big Swims. 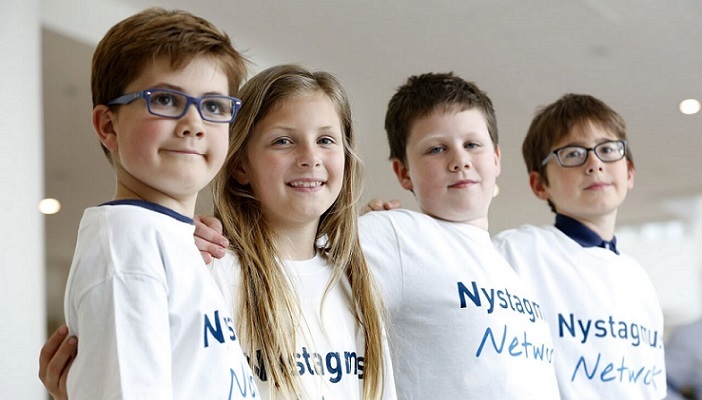 Who is the Nystagmus Network? Since 1984, the Nystagmus Network has been at the forefront in promoting a better understanding of nystagmus as well as leading the way in funding research to find effective treatments. The charity ensures that after a child is diagnosed, the family has somewhere to turn for information, support and advice. Why is an awareness day needed? Sue Ricketts got involved in the Nystagmus Network when her daughter was diagnosed with the condition in 1991. Sue said, “I had never heard of the condition and I struggled to find any help or information - that was before we had the internet. Luckily, an optometrist gave me a leaflet about the Nystagmus Network and through the charity, I was able to connect with other families affected. “Although nystagmus is relatively common, there is still a lot that is unknown about it. Parents of children diagnosed today face the same fears and anxieties I did all those years ago. That’s why the Nystagmus Network will keep raising awareness until everyone has heard about it."